Beatles Bus - You don't know me. Caption contest! I figure the least I could do is give you the Beatles with how absent I've been of late. And, "Oy, looka that! It's our future!" I don't think I can top that one. "I think the Quaker retreat is over there." "I think we lost Ringo back there! Oh feck here he comes and he doesn't look happy!" "John look, The FBI! I told you we were bein followed!" Someone stole my idea. LOL. "And if you poke a hole in the air like this, a fairy dies." "You see that post in the field there, John?" "My next wife won't be able to hop that far." LOL! Omg. HAHA!!!!! that killed me. 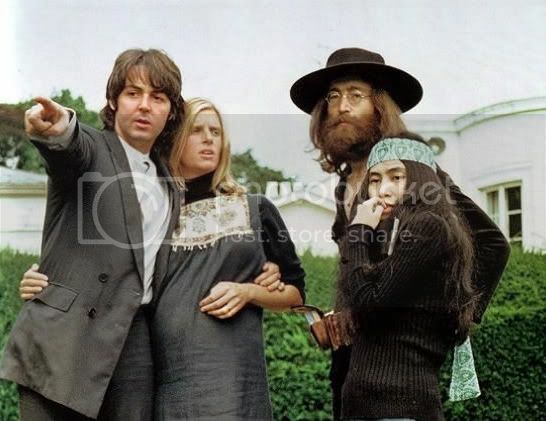 "Hey Yoko, Hell's that way." I love the beatles! FUN! Linda - "Wait a minute, I thought John was married a proper english chit, where is Cynthia? Who is this Yoko person and why is she eating her hand, somebody get her a biscuit." John - "No Paul, I am the Walrus. Kookookachoo." Yoko - "I think I just sharted." "Look Yoko, your people are coming back for you....are they carrying pitchforks?" "Funny how dogs tend to look like their owners, isn't it?" I love how Linda is clearly knocked up in this pic. I have no witty commentary this morning. Paul: "Imagine, John, if you will - all of those people over there who are fighting living life in peace. Yeah, you may say I'm a dreamer, but I'll bet I'm not the only one." John thinking to himself: "Hmmmm...now I have a great song idea. Time to go solo!" LOL! Love it soooooo much! I got no witty caption, but I just wanted to say how unbelieveably amish Paul and John look in this photo. LOL, don't they?! Especially John. And that's an awesome icon.